Join me in Iceland, with a small group of 10 guests, as we take you on the hunt for the perfect light and amazing landscapes at this most beautiful arctic paradise. Led by Kevin Pepper and Skarpi Práinsson, explore the surreal landscapes, seascapes, fjords, waterfalls, mountains, lakes, rivers, northern lights, and stars that are the beauty of Iceland. Over 9 days and 8 nights we’ll cover a tremendous amount of this country—expect to be amongst a group of like-minded photographers who will work hard to learn new techniques and get amazing imagery. You’ll be up early and up late, shooting sunrise, sunset, and northern lights. This workshop is all-inclusive and will feature plenty of instruction in the field and in the digital darkroom. From your home, fly to Reykjavik, Iceland to arrive on or before March 14, 2018. Our workshop begins the morning of March 15, 2018, when we’ll board our private winter-equipped Mercedes Sprinter and head out immediately. For the next 8 nights, we’ll guide you around Iceland to the best shooting venues, each beautiful in their own unique way. Accommodations will be double occupancy with en-suite facilities (single rooming is available). We arrive back in Reykjavik late in the day on March 23, 2018 and you can schedule flights home or elsewhere anytime on March 24, 2018. This itinerary is flexible—we may adjust it based on weather and light conditions or other factors. March 14, 2018: Fly from your home to arrive in Reykjavik (KEF) anytime this day. You’ll likely relax today, but there’s also plenty to do in Iceland’s capital city, and we will provide plenty of information to you. Group dinner this evening, with introductions and a run-through of the itinerary and what you can expect. March 15–17, 2018: After breakfast and checkout, we will board our private, winter-ready Mercedes Sprinter and begin our journey. We’ll head out to Iceland´s Snæfellsnes Peninsula, where dormant volcanoes and glaciers reside side by side on this narrow westward peninsula, full of coastline and mountains. Here at Snæfellsnes are some of Iceland’s oldest volcanoes, inactive for thousands of years, but their vast lava flows are still visible in the landscape. The dramatic backdrop of a beautiful mountain range keeps us perfectly positioned between them and the sea, where the coastline varies between cliffs, beaches, marsh, and farmland. Volcanic craters and Snaefellsjökull glacier are some of our highlights on this day, and we stop at the small fishing village Grundafjörður for lunch. We photograph the famous Kirkjufell (Church mountain), a series of volcanic cliffs and rock islets constantly being crashed by waves. March 17–18, 2018: We will leave Snæfellsnes, and make our way to to Gauksmýri. 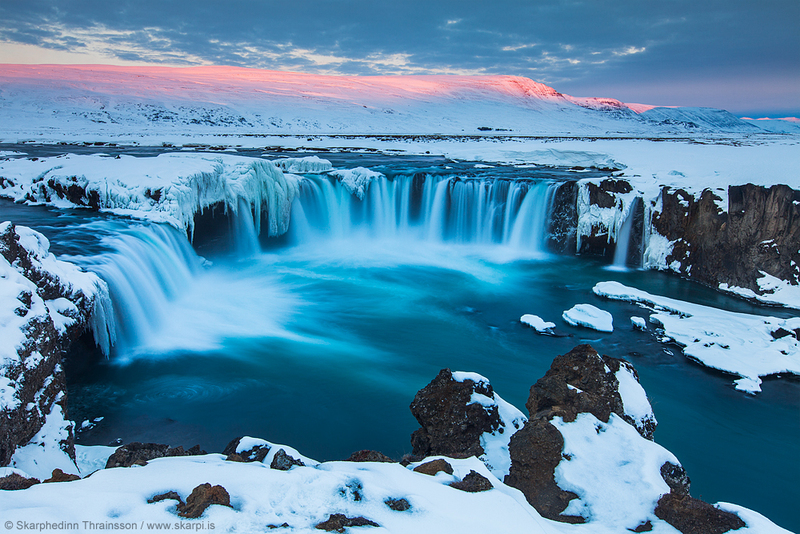 Along the way, we can expect to see and photograph some of Iceland’s most beautiful landscapes. In and around Gauksmýri, our photo ops will include friendly Icelandic Horses, and the great mountains Baula and Skessuhorn—but the main feature of this area is Hvítserkur, the great sea stack off the northwest coast of Iceland. We will photograph Hvítserkur Rock at sunset and sunrise, and, if lucky, with the Northern Lights! March 18–22, 2018: After sunrise, breakfast and checkout, we will travel clockwise around Iceland, passing through beautiful countryside, seaside and more. We can stop at Húsavík, a lovely small port-town in the North of Iceland. Our destination will be Mývatn, in Iceland’s North. We will base for four nights in Mývatn, so we are well-positioned to see and photograph some of Iceland’s best winter landscapes. Our photography menu here includes: Dimmuborgir, the lake area near Kálfaströnd; Hverir and Hverfjall; waterfalls Godafoss, Aldeyjarfoss, Geitafoss, Dettifoss, and Selfoss; Husavik harbor, sea stack Bakkastakkur, geothermal areas Viti (Hell), and Leirhnjúkur. We will have no shortage of things to choose from, sunrise, daytime, sunset, and with luck, Northern Lights at night! March 22–23, 2018: We return to Gauksmýri, and again photograph the wonders of this area, but for sure another chance (or two!) at Hvítserkur Rock. March 23, 2018: After photographing sunrise, we have breakfast and checkout. We'll make our way back to Reykjavik, arriving sometime in the late afternoon. We will have our last dinner together this evening. Workshop concludes. March 24, 2018: Flights home anytime this day from Reykjavik (KEF). Airfare from your home to and from Iceland. Travel and trip insurance (recommended). Alcoholic beverages. Tips for our guides. Anything else not specifically listed above in the “what's included” section. Got questions? We're always here for you. Ready to join us?